Home EXCLUSIVE FEATURES Vision 2030: The road map to Kenya's economic recovery. Vision 2030: The road map to Kenya's economic recovery. A key focus of the Vision 2030 is ensuring Kenyans have a good standard of living via decent housing, sanitation and enhanced security of lives and property. The country has made great strides towards achieving its development goals under the Vision 2030 programme, a long-term development blue-print that aims to transform Kenya into a newly industrialising, middle-income country by 2030. Progress has been made in the achievement of projects outlined in the development blueprint through concerted efforts by the implementing agencies, comprising of all ministries and other government departments. According to Dr. James Mwangi, the chairman of Kenya Vision 2030 Delivery Board and Equity Bank’s Chief Executive, the three Vision 2030 pillars — political, economic and social — have been a success and the country has achieved most of the goals it set for itself. Mwangi reckons that even though Kenya is yet to grow by double digits as envisaged in the blueprint, the income per person has more than doubled since President Mwai Kibaki unveiled the development roadmap in 2008. He has no doubt that in the remaining 12 years, Kenya will achieve double-digit growth and become an upper middle income country. Kenya has been implementing policies and strategies geared towards advancing implementation of the SDGs and this has resulted in commendable progress. Among the key areas of achievement include in the sectors of Housing and Urbanisation, Trade, Manufacturing and in Land Reforms. For years, housing has been a major challenge, being characterised by inadequate affordable and decent housing and low-level of urban home ownership. To reverse this trend, the Jubilee government in its Big Four economic blue-print intends to deliver 1 million affordable homes in the next five years. Out of this, 800,000 units are bedsitters, one-, two- and three- bedroom, costing between Sh800,000 and Sh3 million. The remaining 200,000 units are social housing, which will involve the development of slums (1-2 room units costing Sh600,000 to Sh1 million), a project that is expected to be implemented on 7,000 acres of land in Nairobi, Mombasa, Nakuru, Kisumu, and Eldoret. 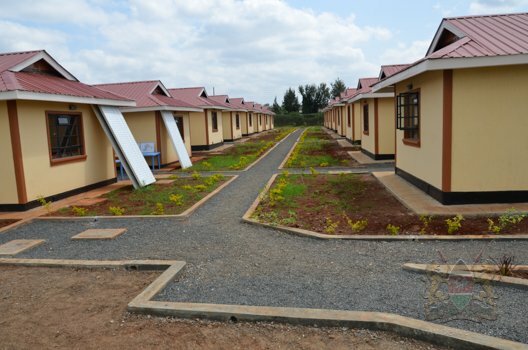 A total of 1678 housing units have already been completed, with 678 units completed under the civil servants housing scheme in Ngara phase I and II, and Kileleshwa. To support the 24-hour Economy initiative in our urban centres, 92 Closed Circuit Television (CCTV) cameras have been installed within Nairobi Central Business District. On disaster management, 63 fire engines have been purchased and distributed within Nairobi Metropolitan Region, 2 firefighting stations in Nairobi rehabilitated and 147 firemen trained. The Sector has also promoted the use of Appropriate Building Materials and Technologies (ABMT) through establishing 19 Housing Technology Training Centres at constituency level, training 300 community groups on use of ABMT and production of Expandable Polystyrene Panels (EPS). Kenya has made significant progress in developing Special Economic Zones (SEZs) in key urban areas within all the eight regions as well as developing 5 SME parks. To enhance integration of small and fragmented individual producers into a big individual source for final consumers and intermediate players, the country intends to create at least 10 hubs and 1000-1500 Producer Business Groups (PBGs), starting with a pilot in Maragua, Murang’a County. The government will also build at least 10 Tier 1 marks in all the regions – starting with a pilot in Athi River, an ICT & Business Processing Outsourcing (BPO) Sector as well as establishing one major BPO park. Modernisation of land registries in the country is key to development. In this regard, the Ministry of land has constructed seven (7) land registries in Bondo, Siaya, Uasin Gishu West, Thika, Isiolo and Trans Nzoia. It has also constructed a banking hall in the Ministry headquarters, Nairobi, initiated construction of Lamu and Meru Ardhi houses and rehabilitated nineteen (19) land registries in Kericho, Kwale, Nyeri, Kajiado, Garissa, Mandera, Koibatek, Kisumu, Kisii, Naivasha, Migori, Central Registry(Nairobi), Nairobi Registry, Kajiado, Kisumu, Kiambu, Nakuru, Ugenya and Bomet. Today, the process of computerising Land Registry (development of a National Land Information Management System) has already kicked off. The Lands Ministry has initiated the safeguarding and digitisation of land records at the Ministry headquarters, Mombasa, Kitale, Nakuru land registries, established a Land Records Conversion Centre (LRCC) at the Ministry headquarters for digitising the land records as well as acquiring and installing an electronic Records Management System in the Ministry headquarters which is at testing stage. Other milestones in the Lands sector include the development of National Land Information System, the development and implementation of the Integrated Land Rent Information System that has captured details of 150,000 Government leased plots into the system, the development of National Spatial Plan, Land Reform Programme and Land settlement that has settled 58,009 poor landless households and issued 435,650 new title deeds. Thika factory fire leaves one dead, 17 injured. URITHI's revenue base hits KES. 4 Billion. MKU now gets the nod to teach law.